General Hospital (GH) spoilers tease that Nurse Amy Driscoll (Risa Dorken) has all the signs of turning into a full-blown psychopath after Nathan West (Ryan Paevey) is fed up with the charade and wants it over – choosing his marriage and love for Maxie Jones (Kirsten Storms) over being the face for Amy’s ‘Ask Man Landers’. It’s very possible that Amy’s obsession with Nathan could turn dangerous, even violent. GH’s Amy Driscoll has been somewhat of a mysterious character, especially since she literally arrived back in Port Charles after not much interaction with any key characters since high school. She seems to be rather secretive and sneaky, even a bit of a stalker when it comes to Nathan. Does anyone recall how she managed to spend so much time with Nathan at his home in order to steal a photo of him and his wife, Maxie? She could have conveniently folded Maxie out of the picture, but instead viciously ripped the photo in half, smirking as she did it. There is something “off” about Amy; she may seem kind-hearted and appear naive, but it is clear Amy is not a dummy! Look at how she questioned Spinelli (Bradford Anderson) when he was getting a little too close to the truth about Ask Man Landers! Fans of the ABC soap opera have seen Nathan repeatedly try to end his role in the advice column that Amy created, after he discovered she was using his picture as his disguise. Amy has pretended to be okay with his decisions, but every time he had attempted to walk away, she knew exactly how to pull at his heart strings to make sure he would stick around for a little while longer. Now that Nathan has been exposed, and the pressure is getting to him and his commitment to Maxie, could Amy be pushed over the edge, feeling rejected? 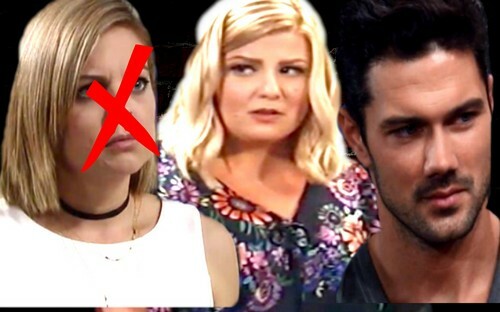 General Hospital spoilers reveal that Maxie has asked Nathan to continue posing as the hugely popular advice columnist in order to advance her own career; which makes her temporarily Amy’s biggest ally; but what happens when Maxie becomes an inconvenience? Remember when Maxie spent all that time in Oregon, working and spending time with her daughter, Georgie? At that time, Amy spent an excessive amount of time with lonely Detective West, and able to reveal her past connection to Maxie known, making some viewers wonder if Amy had a vendetta for everything high school “mean girl” Maxie did to her. Amy feels Maxie is standing in her way to professional success and her ultimately landing the gorgeous detective for herself. In her diluted mind, Amy needs to get rid of Maxie to fulfill all her dreams believing she is a better woman for Nathan, who would never abandon him like Maxie did. GH sources indicate that Amy has been using her injured brother, Chet (Chris Van Etten) as her reason for desperately needing money. Anyone who knows Nathan West, knows he always seems to be the knight in shining armor, willing to do anything to help the underdog but has Amy mistaken that act of kindness as something much more? It is becoming more and more clear that nosy nurse Amy Driscoll will not like being put in the corner and no longer be the focus of Nathan’s attention. General Hospital spoilers all point to Nathan wanting out of the spotlight, and Amy not taking the news very well. It just remains to be seen what drastic steps Amy will take to make sure Nathan stays by her side as the truth about her role in Ask Man Landers continues to unravel. How do you think Amy will cope with Nathan’s rejection?